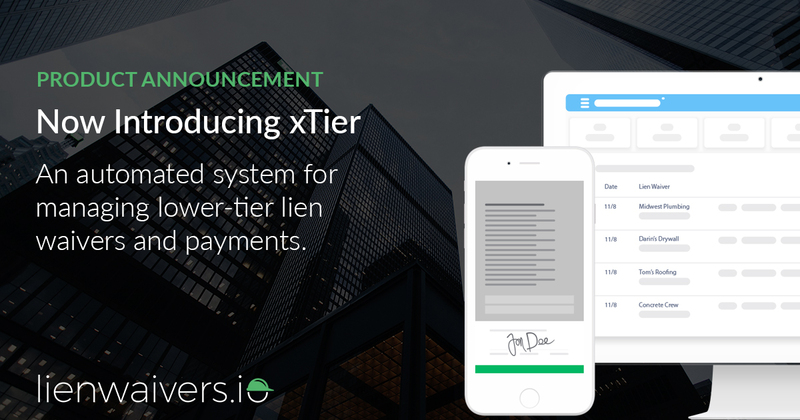 SIOUX CITY, Iowa, November 13, 2018	(Newswire.com) - lienwaivers.io introduces xTier, an automated system for requesting, collecting, and tracking lien waivers and payments from all parties involved in a construction project. lienwaivers.io xTier provides unprecedented visibility into payments flowing from owners through general contractors and primary subcontractors to lower-tier subcontractors, equipment vendors, and material suppliers—surfacing actionable data, signaling risk, and prompting intervention long before a lien is ever filed. lienwaivers.io xTier pairs preliminary notices with sworn statements and lien waivers in a simple, streamlined workflow. General contractors can choose to request lien waivers from primary and secondary vendors, or all claimants on a project, using custom lien waiver templates and multiple signing options. xTier is immediately usable by every claimant. Subcontractors, vendors, and suppliers do not need a lienwaivers.io account to complete their lien waivers. Upon signing, lien waivers from lower tiers are available to general contractors through their lienwaivers.io dashboard. In addition, users of lienwaivers.io electronic payment services can exchange lien waivers and payments with lower-tier vendors via same day ACH, eliminating the need for clumsy joint check processes. lienwaivers.io xTier works together with existing lienwaivers.io integrations to bring lower-tier lien waivers to common construction accounting and management systems such as Procore, QuickBooks, Sage, and Xero. DocuSign customers can easily connect their account to lienwaivers.io to leverage DocuSign’s electronic signature and notarization services. Check out lienwaivers.io’s lower-tier lien waiver solution by visiting DocuSign’s booth #305 on Nov. 13, 2018, at 1 p.m. CST at this year’s Procore Groundbreak construction conference in Austin, Texas. At lienwaivers.io, we’re building best-in-class cloud-based construction disbursement solutions. Our platform leverages leading technology to save builders time and money while reducing their operational risk. lienwaivers.io enables contractors to request, collect, and track lien waivers using their existing accounting or project management systems, including Sage 100, Sage 300, QuickBooks Desktop & Online, Xero, and Procore, without duplicate data entry. In addition to lien waiver tracking, lienwaivers.io offers advanced features such as electronic signature, electronic notarization, electronic ACH payment and W-9 collection all from a user-friendly, cloud-based dashboard. lienwaivers.io automates the manual and time-consuming construction lien waiver and payment process, saving builders hours per month, while reducing lien risk and enabling contractors to pay, and get paid, faster. The company focuses on convenience and security, and meets SOC 1 and SOC 2 standards for financial controls. Our cloud-based software is pay-as-you-go, with no expensive installations or complicated training. For more information, visit https://lienwaivers.io or follow us online at @lienwaivers on Twitter or Facebook at facebook.com/lienwaiversio.